Who said riverside pubs are good only in summertime? 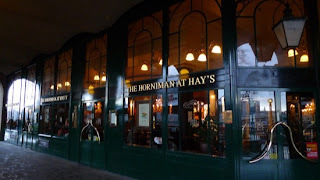 Going for a pint or for cosy, warming food after a long cold day, are my favourite ways to relax. Even better if the view reminds me of a Turner painting. I love riverside pubs in winter time: looking out of the window at the river and the London skyline, whilst eating a traditional pie or bangers and mash, is the best way to spend a chilled Saturday evening or a grey Sunday. 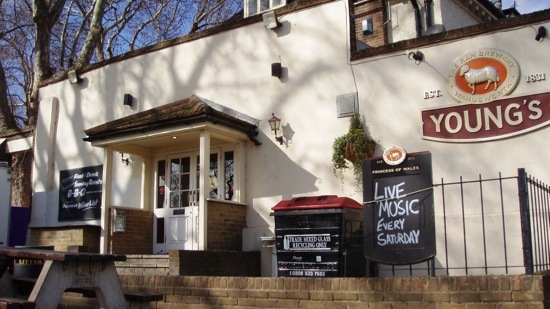 Here are my Top 5 Cosy “By The River” Pubs In London. 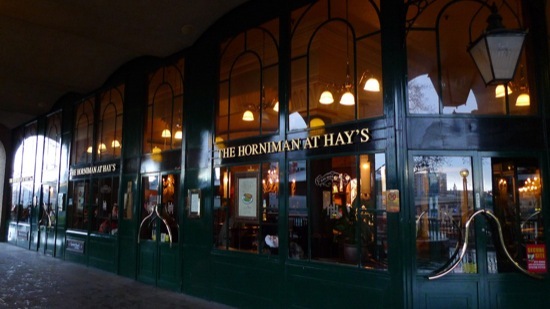 The Horniman – at the Hays Galleria - is an excellent pub for events and the usual happy hours. I visited this pub during the festive season in 2011 when the pub was in full swing. I attended an event for the presentation of a new Christmas range of Nicholson’s Freehouse Ales. It was an interesting presentation. I also enjoyed being pampered by the excellent staff. The Cellar was great; very retro style. The upstairs area is traditional and has various big screen TVs to watch sport events. It’s great to grab a seat outside by the river - there are plenty of patio heaters - to check out Tower Bridge and the beauty of the London skyline. The pub serves a good range of ales and traditional British food. A nice place to park up if you want to be avoided on Friday nights, if you don’t like after work drinks congestion. This is by far my favourite riverside pub. 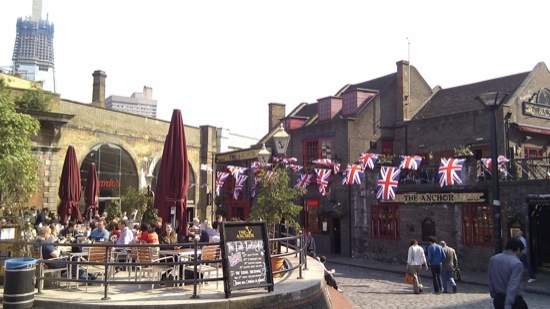 Just down the road from Vinopolis and the riverside - off London Bridge - The Anchor pub is spacious and excellent for “hang around” type pub visits. Real antiques, characteristic low beams, and visible brickwork and fireplaces make it a must-visit in London. The stunning 18th century Shakespeare Room, is available if you have a birthday or – why not – you are getting married. The service and the ales are really great. Avoid food on busy evenings, though. Great terraced seating outside. To be dodged if you don’t like tourists. This pub in Clapton is very traditional but unique for its location, just by the river. Its name actually commemorates Princess Diana. My favourite from their menu are the homemade pies, which are usually listed as house specials. The chicken pie is top of my list. The pub’s strength is not the beer (although pleasant) but the very traditional food. People who go by boat mainly frequent it. A comfortable atmosphere, a guaranteed seat to eat traditionally and a peep at the river at the same time. Location, location, location! This is pub is spectacular. Just on the river, a few minutes from Richmond Bridge. Perfect post-cricket pub. 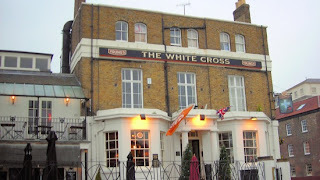 In winter the pub is excellent since it offers a fantastic inside retreat with fireplaces, and real fire! Upstairs balconies give you the option of a great view. The ales are excellent too. I went there couple of times for Sunday roast. It is served till late at night and is delicious, abundant and inexpensive. 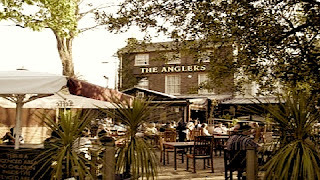 Right on the river Thames, in Teddington, The Anglers is a rustic, truly British pub in a great setting. Creaking wooden floors, well-worn leather chairs and varnished wooden tables all work to give the pub that special rustic touch, while heavy velvet curtains and paintings on the wall keep things classy. A huge conservatory leads out to an equally huge garden. There’s plenty of seating inside and out. 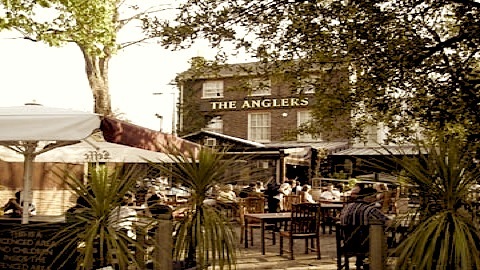 Family-friendly, The Anglers is filled with people of all ages, with Sunday lunches being particularly busy. The atmosphere is relaxed and comfortable. The menu is predominantly British, with hearty home-cooked dishes: ham terrine, pork with apple sauce and on Sunday, succulent, juicy roasts and giant Yorkshire puddings, crunchy potatoes and fresh vegetables. There’s a great choice of beers and wines. If you want to get cosy by the fire in winter, spend a day with the family, be relaxed but in an elegant, warm atmosphere, this is your ideal pub. Images courtesy of Flickr users Ewan-M and Jim Linwood.